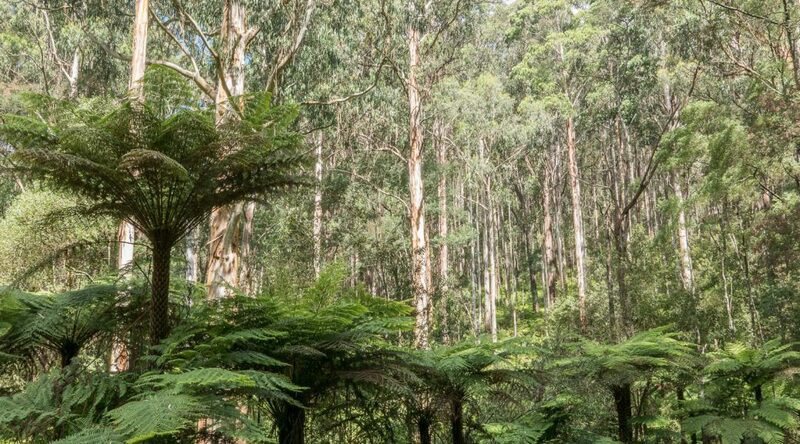 The Dandenong Ranges or simply, the Dandenongs, are a range of hills near Melbourne, Victoria, Australia. 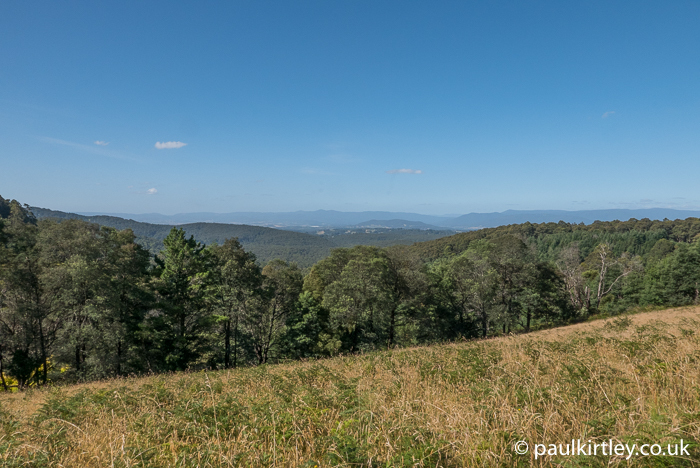 At about 20 miles out of the city, the proximity of the Dandenongs put the area within easy striking distance during my recent stay. I’ve been to the Dandenongs before but I wanted to return because the forests there are simply magnificent. The slopes and in the gullies of this area are characterised by towering mountain ash, a.k.a. 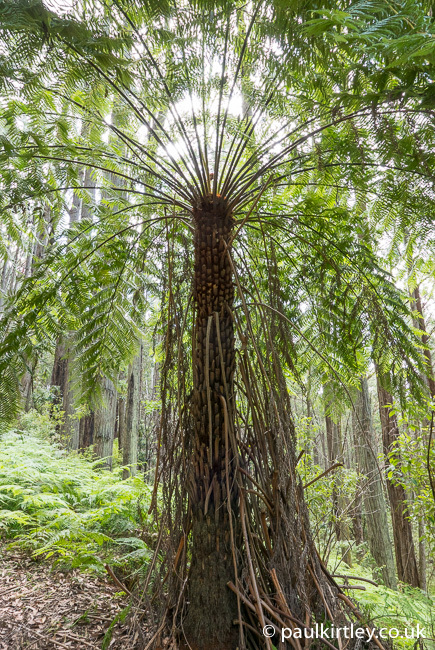 stringy gum, Eucalyptus regnans, and rough tree ferns, Cyathea australis. We headed up there for a day hike, parking at the Woolrich Lookout above the RJ Hamer Arboretum. Our aim was to drop down from there into the Olinda Valley, completing a circular route, descending on one side of the valley, before crossing Lyrebird Gully Creek to head back uphill to our start point from there. We headed out for a day hike in the Dandenongs. Photo: Paul Kirtley. What strikes me about the country close to habitation in this part of the world is the interesting mix of the strange and the familiar. There are native species here that have commonalities with relatives found in Europe. There are also a good number of species that are familiar by virtue of the fact they have been introduced and naturalised following colonisation. Then there are the species that are alien to me but native to this part of Australia, which I’m still getting to know. 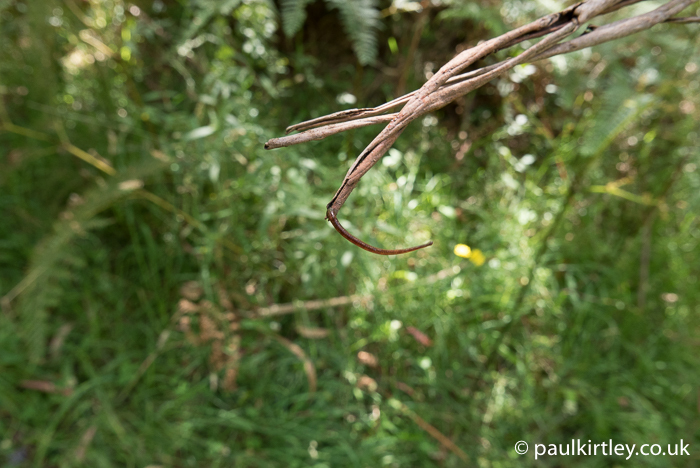 This photoblog captures some of the strangers we saw on our day hike in the Dandenongs – some strange to me and some once strange to the place but now established. The photos here were all taken on 3 January 2018, in Victoria, Australia. Not long after this we came to a little glade, awash with sunlight and full of vibrant purple. Again my brain switched from trying to process the unfamiliar to recognition of the familiar. Flower heads of self-heal, Prunella vulgaris, were providing the purple. It’s a common and widespread species back home, always a feature of our summers in the UK, but it was somewhat odd to see it blooming in early January. 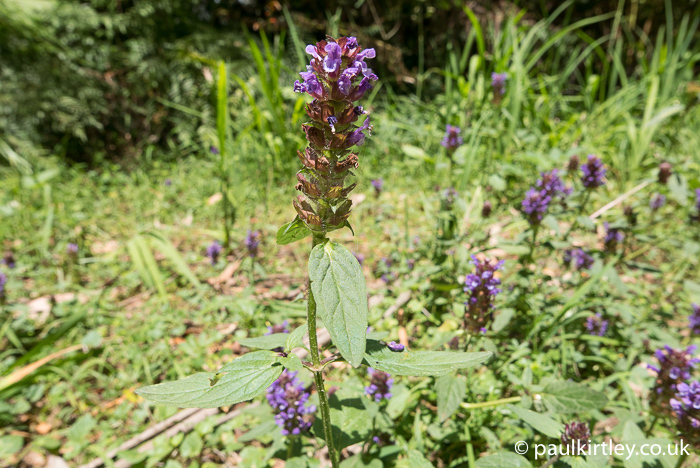 Self-heal, Prunella vulgaris, in flower. Photo: Paul Kirtley. We continued along the track which, while undulating, was overall taking us downhill. 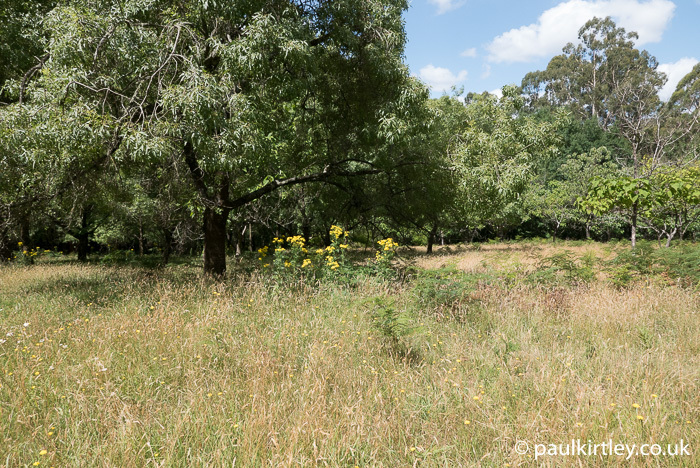 Here we were still in the arboretum and native gums rubbed shoulders with European and North American tree species, including relatively juvenile Wellingtonias. After a crossroads in the track, we dropped down steeply on a water-eroded trail through open woods. There was more light and a host of butterflies. These were mainly common brown butterflies, Heteronympha merope. 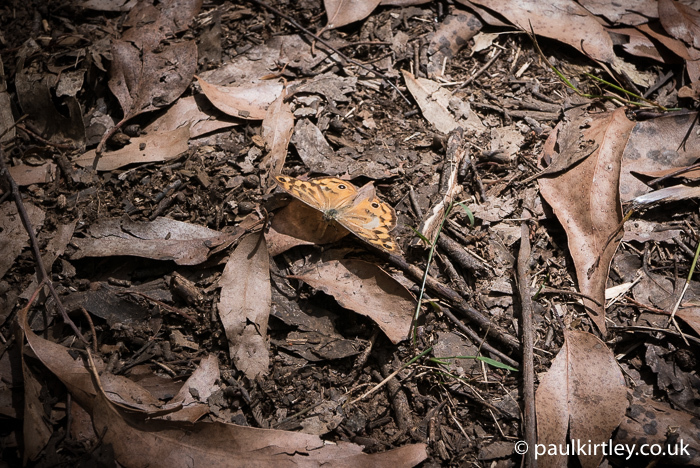 A common brown butterfly bathing in sunlight streaming through the forest canopy. Photo: Paul Kirtley. We turned left and continued down towards the centre of the valley. 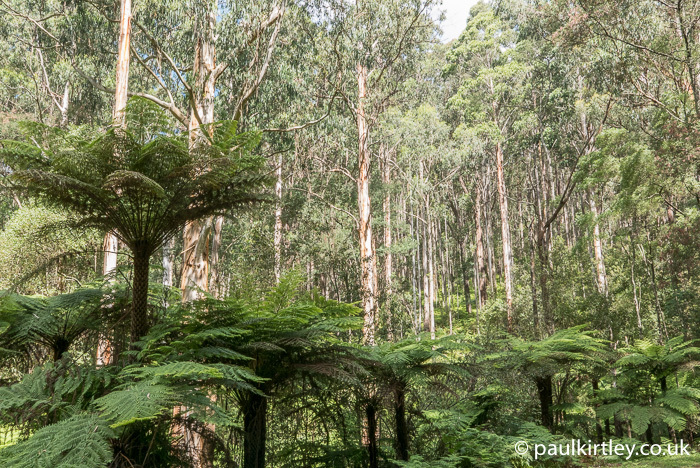 The trail took us through some magnificent stands of tall native gum trees, with an understorey of ferns, from bracken ferns to tree ferns. We joined a more significant track and continued into an area of more mixed woodland, with some areas of grass and bracken. Here there were many familiar European plant species. 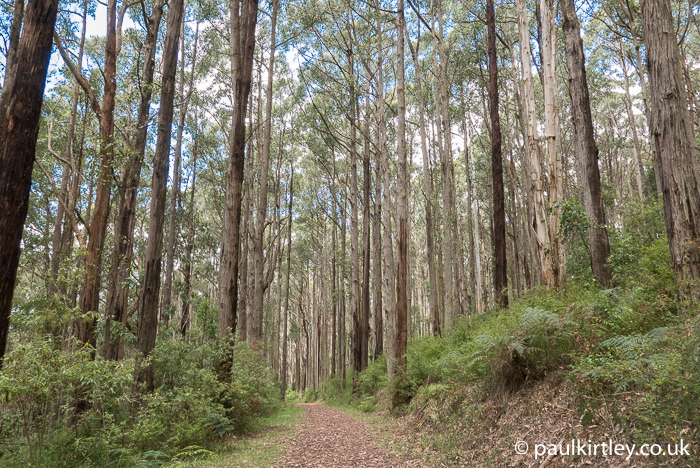 Magnificent forests on the slopes of the Dandenongs. Photo: Paul Kirtley. 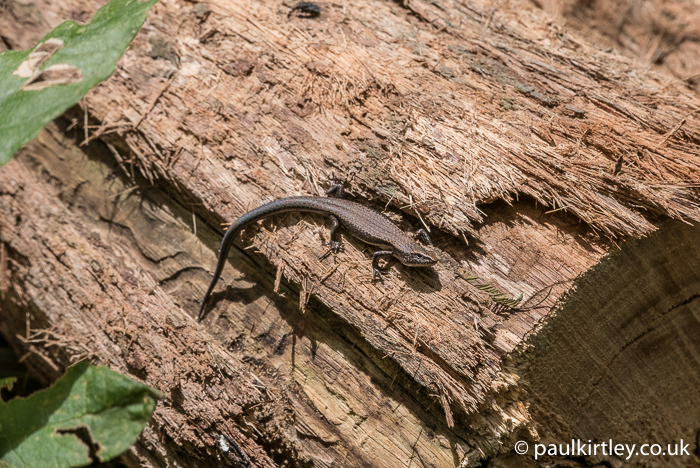 A little skink rests on a sawn log, enjoying the sunshine. Photo: Paul Kirtley. Great mullein, Verbascum thapsus, standing upright on the bank next to the track. Photo: Paul Kirtley. 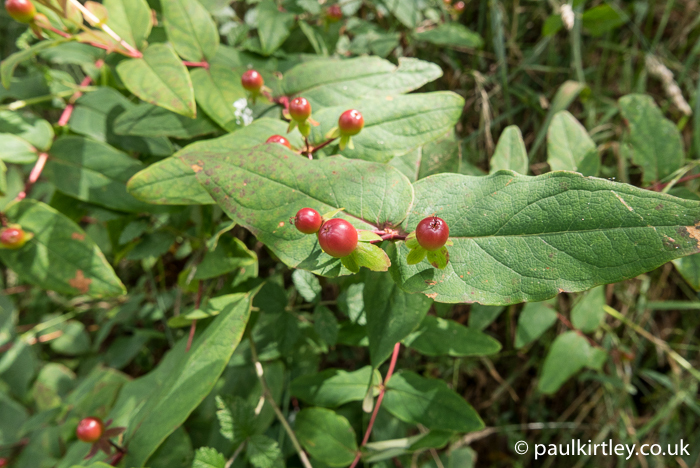 The berries of tutsan, Hypericum androsaemum, in the intermediate stage of ripeness when they are bright red, before fully ripening to a near-black colour. Photo: Paul Kirtley. 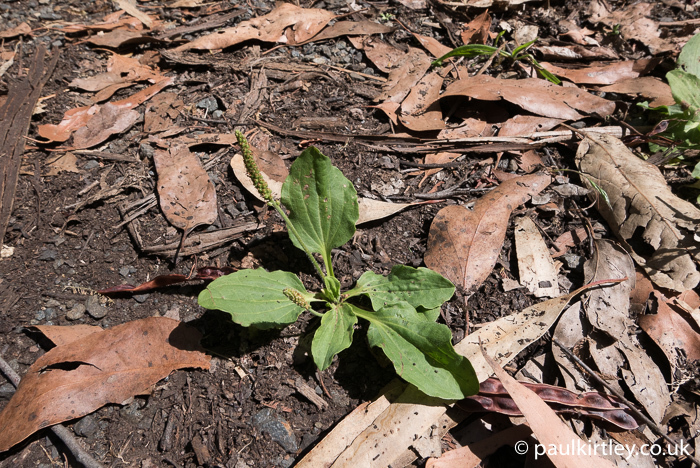 Broadleaf plantain, Plantago major, in its typical preferred substrate of hard, compacted earth of a track, albeit on the wrong continent. Photo: Paul Kirtley. 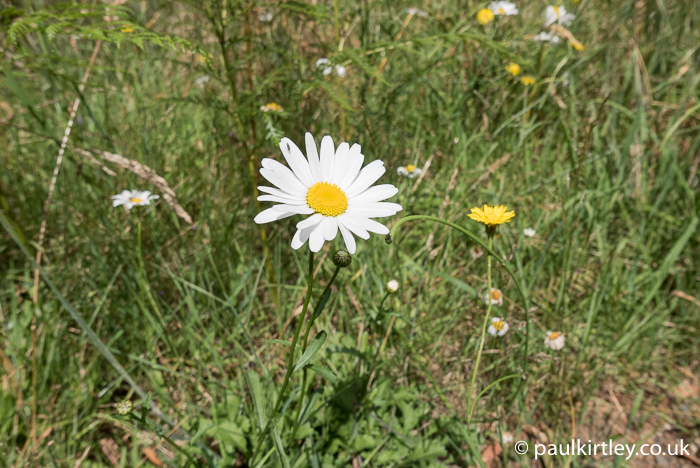 Oxeye daisy, Leucanthemum vulgare, worshipping the Australian sun. Photo: Paul Kirtley. 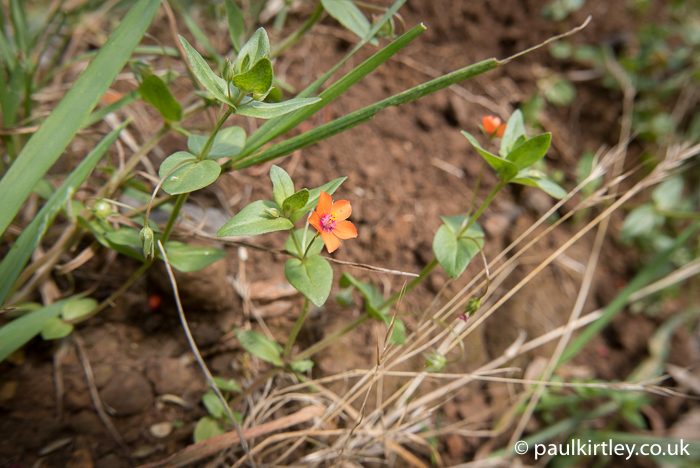 It never ceases to surprise me how far and wide I find scarlet pimpernel, Anagallis arvensis, on my travels. Photo: Paul Kirtley. Ragwort, Senecio jacobaea, seems to have become a pernicious weed almost everywhere, including here in Victoria. Photo: Paul Kirtley. Would you like to strengthen your ability to identify northern temperate species such as those featured above? Take a look at my Tree & Plant Identification Masterclass. It is aimed squarely at people who want to be able to identify species for the purposes of bushcraft and survival. The links below will take you to the VICFLORA entry for the respective species provided by the Royal Botanic Gardens Victoria. 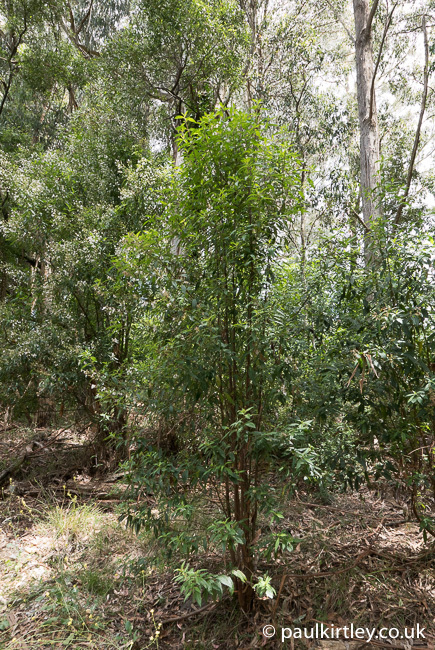 These entries contain an overview of the species, some images and information on its distribution in Victoria, including a distribution map. For me, there’s something primordial about tree ferns. Something of the Conan Doyle’s The Lost World about them. I wouldn’t be overly surprised to see a pterodactyl flying overhead when in amongst them. While small ferns are very familiar from Europe, tree ferns are decidedly different. It was great to see so many of them in the Dandenongs. 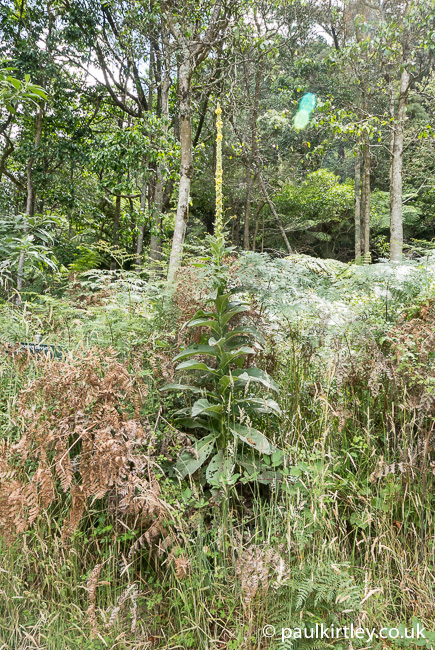 In addition to rough tree ferns, Cyathea australis, here in the Dandenongs there are also specimens of soft tree-fern, Dicksonia antarctica, and gully tree fern, Cyathea cunninghamii amongst the other ferns, including bracken ferns of the Pteridium genus. A host of tree ferns down in the lush valley bottom, not far from the creek. Photo: Paul Kirtley. There is a parasol-like effect when standing under a rough tree fern, Cyathea australis. Photo: Paul Kirtley. These flowers clearly belong to a member of the family Lamiaceae, the mint or dead-nettle family but these were on a shrubby bush, something we are not used to seeing in Europe. 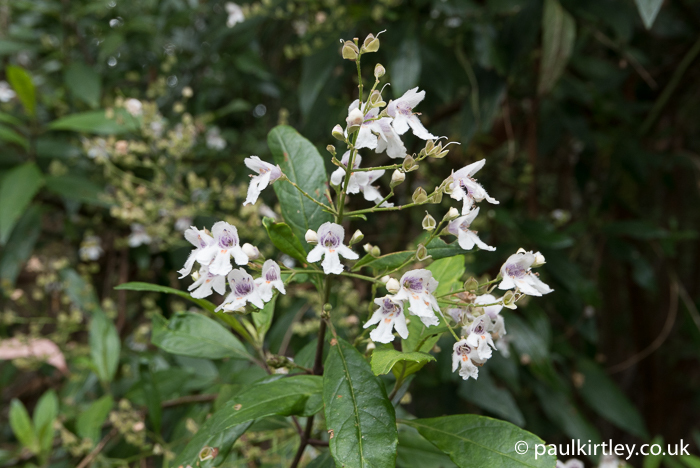 The species here is the Victorian Christmas bush, Prostanthera lasianthos, one of the mint bushes found in Australia. The leaves when crushed do smell of mint. Photo: Paul Kirtley. Standing back and looking at this example of the mint bush, anyone who has used a hand-drill for fire-lighting can see the potential in the straight upward shoots. Indeed Aboriginal peoples have traditionally used this plant as a source of fire drills. Photo: Paul Kirtley. 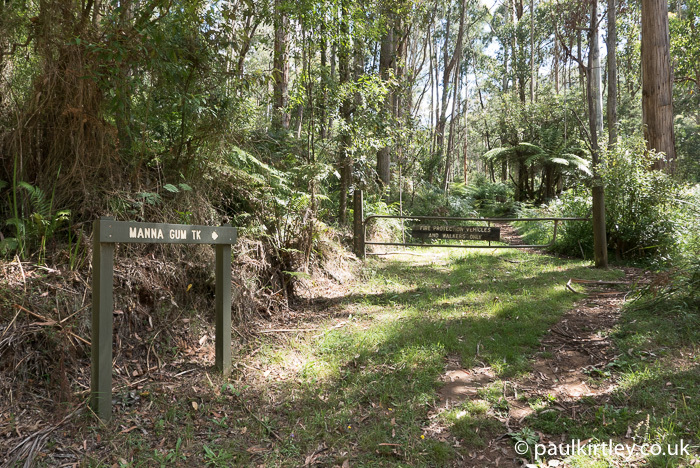 Heading back uphill, taking the Manna Gum track. Photo: Paul Kirtley. In this relatively damp and green section of the trail, there were a few land leeches. We both felt the tell-tale coldness that precedes a bite and removed them from our lower legs. This one (on the end of a stiff section of bark) was removed from Amanda’s shoe as it made its way towards her flesh. You can see the leech is attached at its base to the bark, and the other end, where the head and mouth parts are located, is searching for the host it was just removed from… Photo: Paul Kirtley. As we moved further uphill, away from the verdant track lower down and into better drained, drier slopes, we left the leeches behind. Here we heard rustling in amongst the flax lilies on the ground. Before too long, up flew a couple of colourful rosellas. As we continued up the trail, this happened repeatedly. Birds flying up from the ground. This plant has flowers of a familiar form but the spiny leaves are decidedly alien. This is forest nightshade, Solanum prinophyllum. Photo: Paul Kirtley. 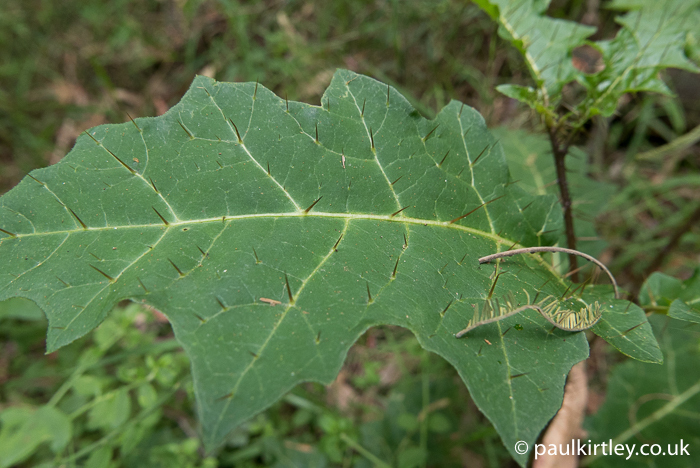 The feather-like structure of this leaf is reminiscent of several northern hemisphere plants, in particular the elders. 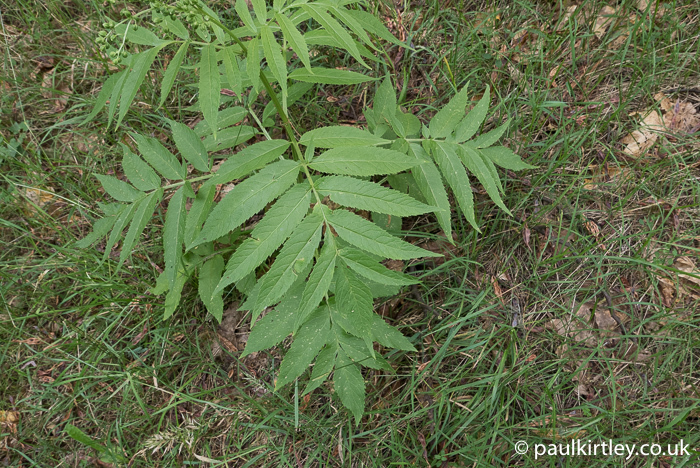 This is in fact, the native Australian plant, white elderberry, Sambucus gaudichaudiana. Photo: Paul Kirtley. 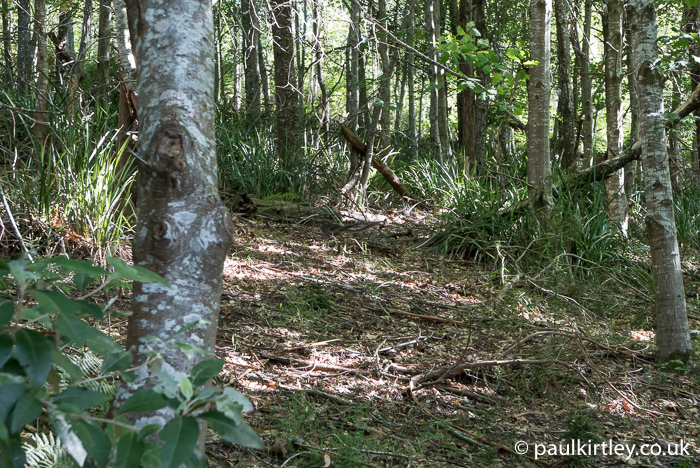 The trail we had been following had been running parallel with the course of Lyrebird Creek and following a little loop taking us further away from the creek we were now contouring round the head of this little valley, getting closer to the course of the creek again. I heard a rustling in dry leaves, the source of which was obscured by ferns in the immediate foreground. I stopped for a moment, then continued quietly along the grassy track. I still could not see anything but the sound coming from the bush to my right reminded me of the sound blackbirds make while tossing aside leaves to get at grubs and worms underneath. Then I saw him. A lyrebird grubbing around in the leaf litter. He was in a shady patch and hard to see. If you look closely in the photo below, he’s just above the light patch in the middle of the photo. Can you see him? Photo: Paul Kirtley. It’s not the clearest of images as this is a crop of the previous photo that has been significantly enlarged. Again he is in the middle of the frame. You can see his long tail feathers. Photo: Paul Kirtley. 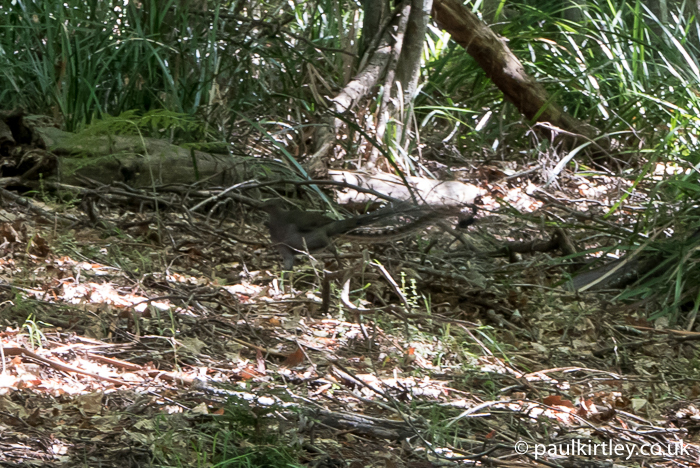 It was very fitting to see a lyrebird just above Lyrebird Creek. Shortly after this we took a narrow trail steeply uphill that abruptly came out of a narrow aperture in the bushes to meet one of the main tracks at right angles. It was almost as if we’d come out of a secret door. Here there were people walking in each direction on the main track. It was all a little jarring. We’d not seen a soul on our entire climb back out of the valley bottom. We quickly left the main trail again. To finish, it was another steep climb, this time longer and out of the relative coolness of the woods. The trail took us into the bright glare of the angled grassy meadow below Woolrich Lookout. The reward at the top, however, was a brilliant view out over the top of the canopy of trees we’d been under for the majority of our hike. Looking back over the forest we had been walking in, from the vantage point of Woolrich Lookout. Photo: Paul Kirtley. 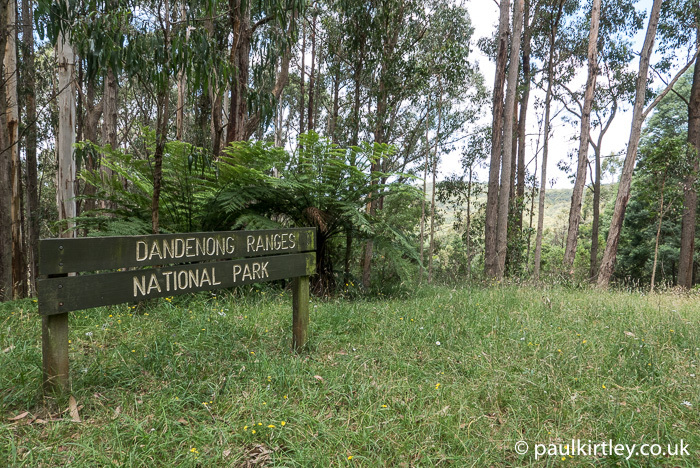 The Dandenongs are far from being one of the wilder parts of Australia but there was still plenty to see here and learn about. Plus it’s good exercise tramping up and down these hills. The links below will take you to the VICFLORA entry for the respective species provided by the Royal Botanic Gardens Victoria. Want To Get Better At Tree & Plant Identification? If you’d like to strengthen your tree and plant identification skills, then you should take a look at my Tree & Plant Identification Masterclass. It is aimed squarely at people who want to be able to identify common, widespread and useful species for bushcraft and survival. Find out more here. What Are These Wild Wanderings Blogs Anyway? Wild Wanderings is a series of photoblogs of elements of nature which, having caught my eye while out and about, I want to share with you, the reader. These observations are typically related to tree and plant identification, animal tracks and sign and other aspects of natural history which pertain to bushcraft and survival skills. These blogs do not usually contain much written explanation other than concise photo captions. This is intentional, as writing long descriptions, including background facts or a large amount of context, whether it be historical or contemporary, slows down the sharing of these images with you. The above photos were taken with the diminutive yet powerful Leica D-Lux (Type 109), which is my compact travel camera of choice. Hi Danny, thanks for your thoughts on this Wild Wandering mate. Lovely description of your walk through the Aussie countryside. Bit disconcerting about the leech eugh! I am so glad you put up the second picture of the lyrebird I really couldn’t see it in the first one. Thanks for sharing your walk Paul. Nice to hear from you and I’m glad you enjoyed this little virtual walk with me. Yeah the leeches are a bit disconcerting when you are wearing shorts. I’ve had them bite me before (when I was in Queensland) but managed to avoid them getting a hold on me at any point on this trip. Hi Paul, thanks for sharing more of your wanderings. The photos are amazingly clear. Am I right in thinking that the Mullein root can be used to make insect repellent ? I love the tree ferns, as you say very prehistoric looking, I can imagine dinosaurs in amongst them. Thanks for your comments. I’m glad you enjoyed this and appreciated the quality of the photos, particularly the tree ferns. 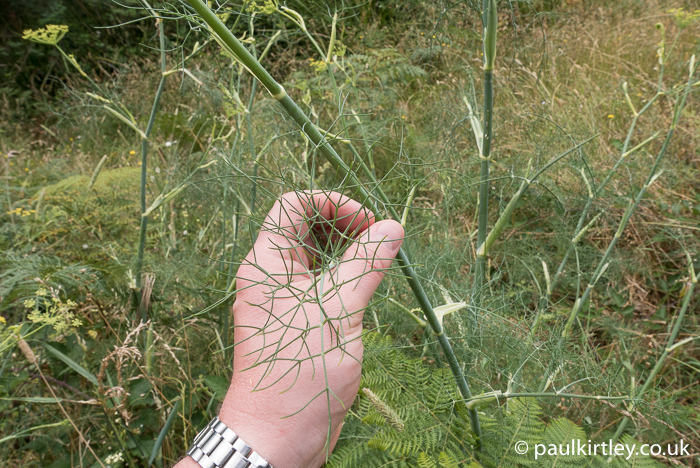 As for V. thapsus – I know of some people recommending rubbing the leaves on the skin as an insect repellent. I’ve not heard or read of the roots being used in this fashion though, not to say it hasn’t happened though. I do know the roots were used extensively for medicinal purposes, as well as the leaves being used for various medicines, particularly around respiratory complaints. Hi Paul, thanks for your reply. Much easier to forage some leaves to keep the mosquitos away. I enjoyed your description of your walk. I watched it on a cold, miserable, wet morning and it cheered me up quite a lot. I couldn’t see the lyre bird until you enlarged the photo just shows nature’s natural camoflage. Good to see you in my Neck of the Woods Paul. Thanks for another great vicarious experience. Much of the pleasure with none of the sweat! Saved this article to read when I got back from a trip. Enjoyed the hike with you. Photos of paths leading into the woods are always inviting and these were no different. Liked the flora and fauna photos, also. I think that all of us can relate to a hike of this nature, as opposed to other adventures that may be out of our capability. Hi Rosemary, thank you for your comments. I’m happy you enjoyed accompanying me on a virtual hike and that you could relate to the hike.